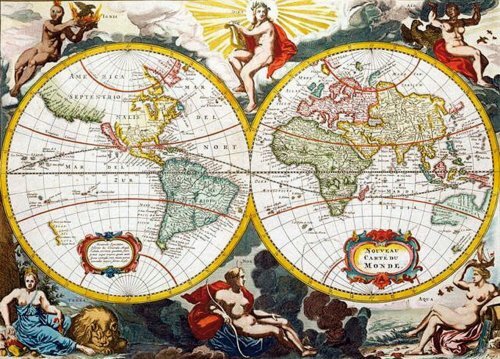 Are you looking for an Old World Map Jigsaw Puzzle? 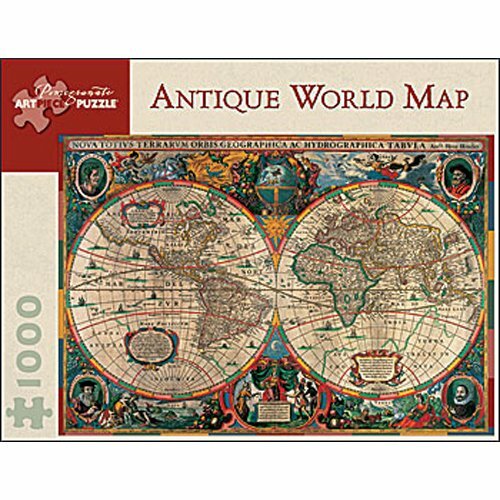 On this page you’ll find a really great collection of antique looking world map jigsaw puzzles. In a Rush? 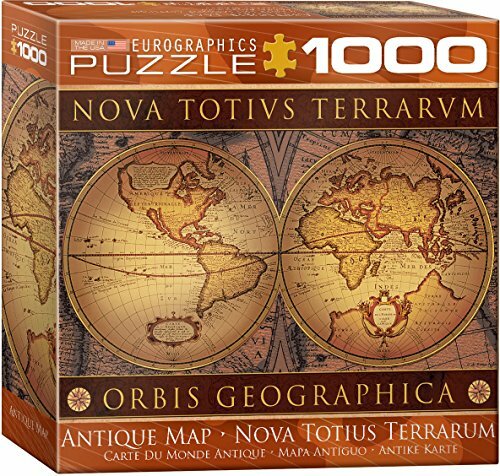 Check out all the Great selection of World Map Puzzles at Fabulous Prices! 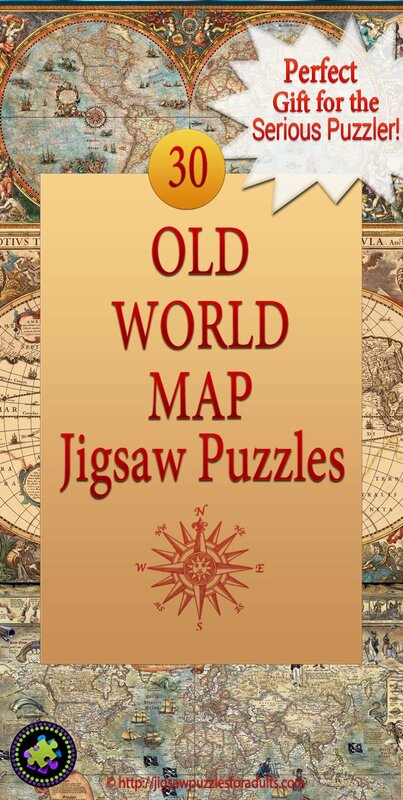 If you love old maps you are sure to enjoy working on an Old World Map Jigsaw Puzzle. 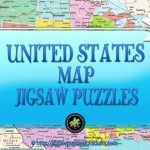 You’ll find map puzzles on this page that have from 40 pieces all the way up to a whopping 6000 puzzle pieces. 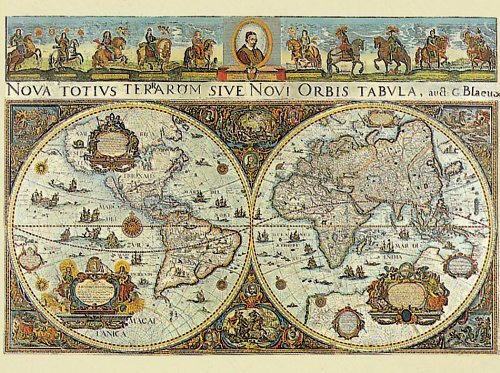 These Old World Maps have a little bit of everything. 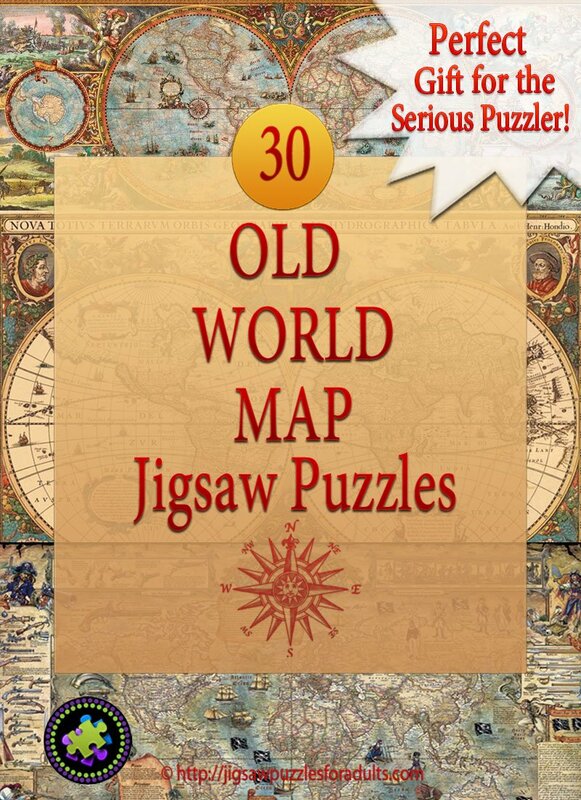 Some of the large old map jigsaw puzzles are quite challenging but all in all they are fun to work on. 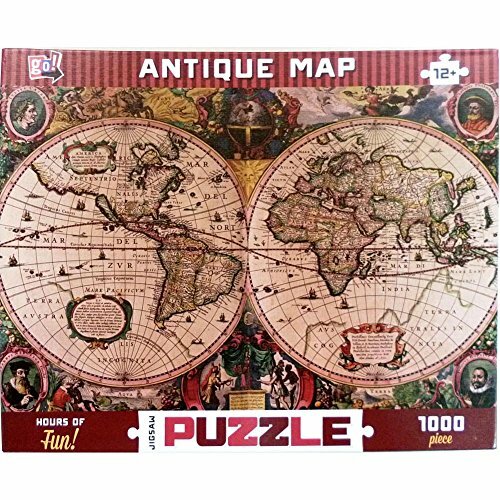 So let’s have a look at all the old map puzzles and find one World Map Jigsaw Puzzle that is perfect for you. 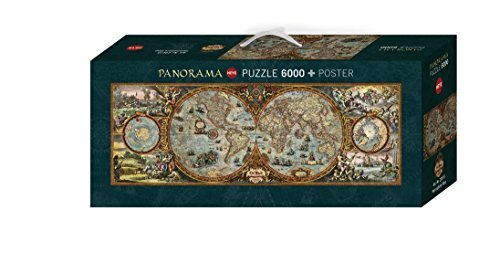 We have to start our selection of Old World map jigsaw puzzles with this Panoramic Hemisphere Map Jigsaw puzzle by the Heye Puzzle brand. 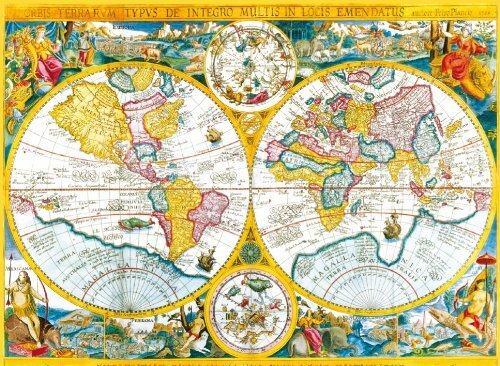 The Hemisphere Map Jigsaw puzzle is just one of the many map jigsaw puzzles in the Heye World Map series however, if you’re looking for a challenge it is one of the most impressive world map puzzles on this page. 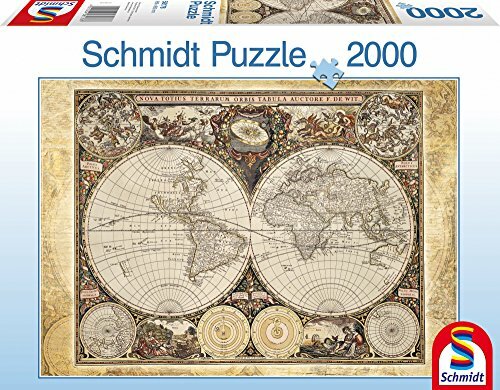 This puzzle is highly detailed; and shows both hemispheres as well as the north and south poles along with beautiful artwork. It also comes with a large poster that you can use for reference. The Hemisphere puzzle comes divided in 4 different bags labeled (A,B,C,D) and each has 1500 pieces. 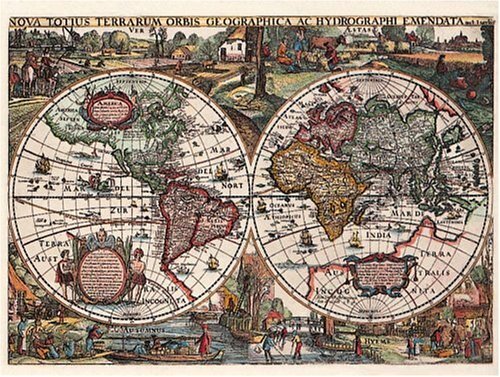 The Hemisphere puzzle map is the ultimate challenge when considering the idea of working on a Old World Map Jigsaw puzzle. 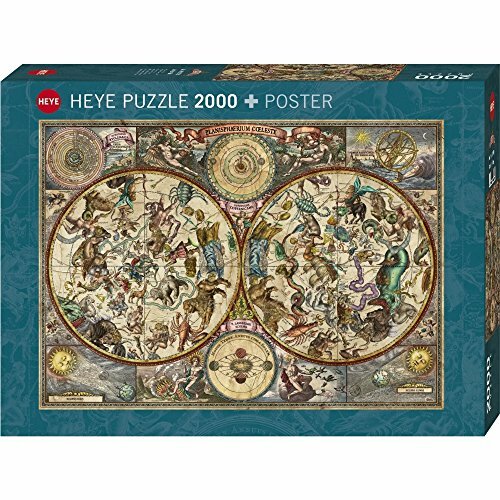 This puzzle is made in Germany by Heye puzzle company which happens to be a favorite puzzle brand among avid jigsaw puzzle fans. 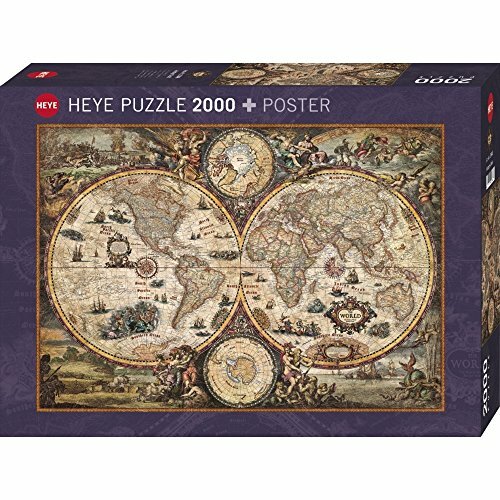 You might recognize the Heye brand because of their popular cartoon jigsaw puzzles that come in those unique triangle boxes however, the Hemisphere map puzzle comes in a rectangle box. 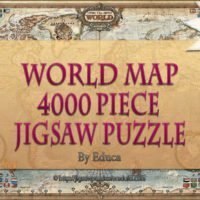 Some might say that this isn’t a genuine Old World Map jigsaw puzzle because it uses a current map, but the puzzle is done in an old-world style which we think quite unique. 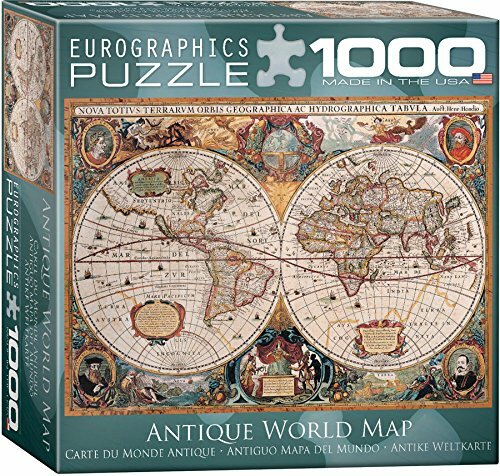 Below you’ll find a number of Map puzzles by the Heye brand. 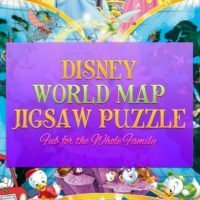 If you’re a puzzle enthusiast and a fan of Pirates you’ll love this Pirates World jigsaw puzzle that is both educational and exciting. 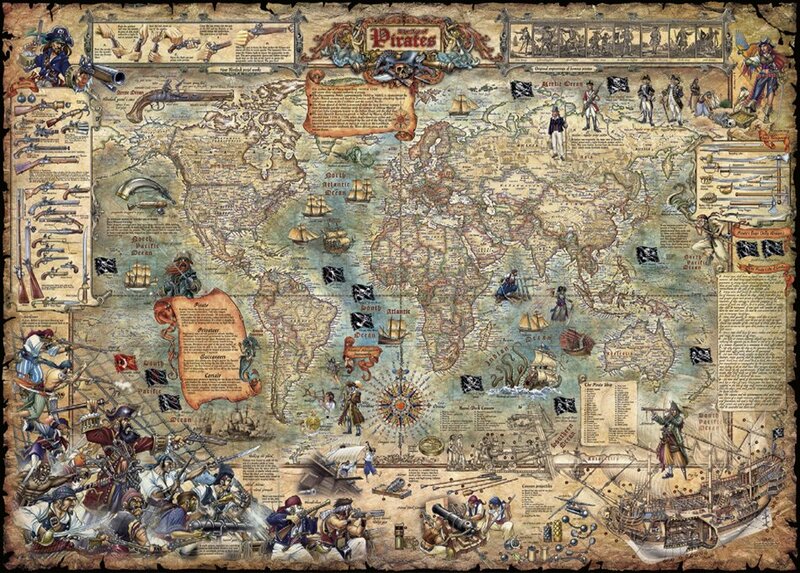 It is filled with loads of information and depictions of Pirate life. 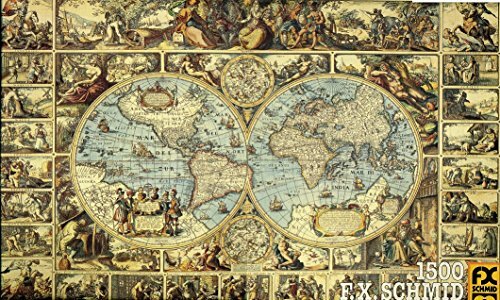 Heye Pirate World 3000 Piece Map Jigsaw Puzzle measures 45.9 inches by 32.87 inches(116.5 x 83.5 cm) finished and is made in Germany. 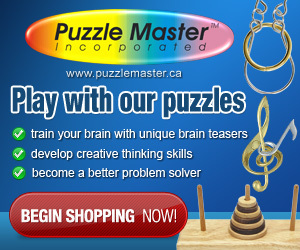 This is a Great puzzle for the whole family, perfect for seafarers and puzzle enthusiasts. 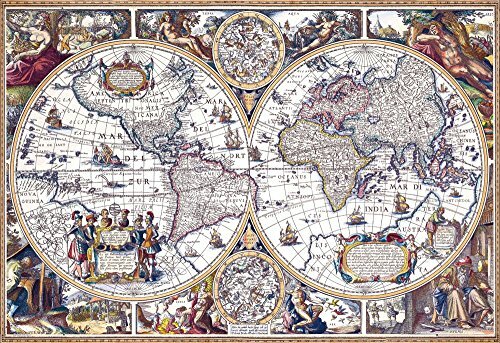 This Ravensburger Old Globe World Map 5000 piece puzzle will keep the most avid jigsaw puzzler busy for weeks. 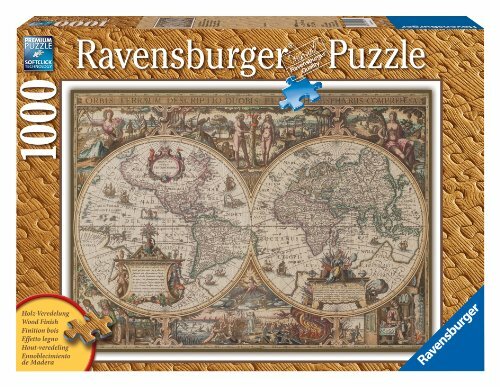 As can be expected this Ravensburger puzzle is excellent in quality. 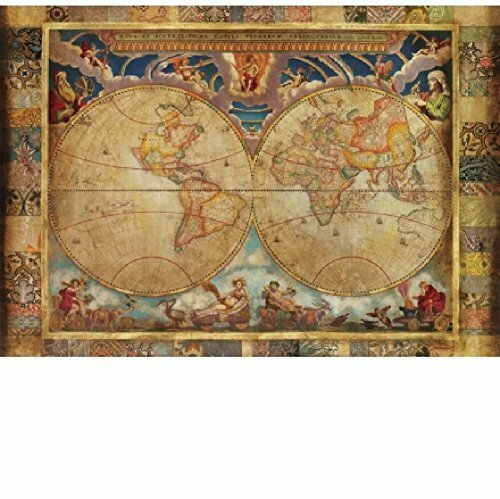 If you decide on buying this Ravensburger Old Globe World Map 5000 piecejigsaw puzzle you’ll need a little bit of extra room as it measures approximately 60 inches by 40 inches (153 x 101 centimeters). 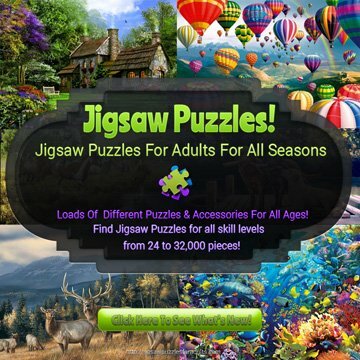 If you’re anything like many of the avid puzzlers you’ll like having your puzzle available at all times to work on. 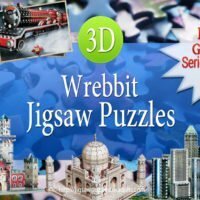 That being said you’ll need a specific table large enough to hold your entire puzzle and if you don’t have a large enough surface already you need to check out some of these folding wooden puzzle tables. 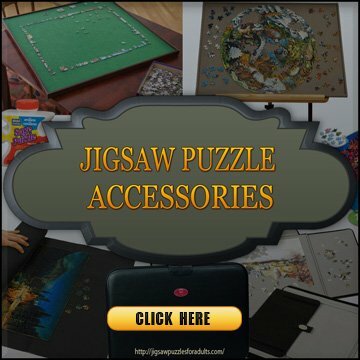 The nice thing about these tables is that when you’re not using them for your puzzle assembly, they can be stored away until you need them for a new activity. If you are kind of curious as to what this puzzle is like when being assembled I’ve found a great video of it being assemble and than mounted. I hope this vedeoo gives you an idea of what to expect with this 5000 piece puzzle by Ravensburger. 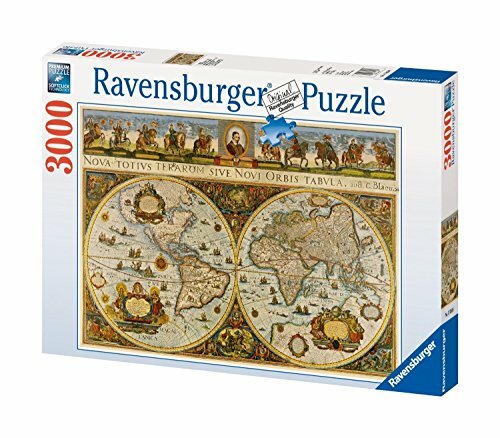 Being a Ravensburger puzzle you can be sure that that this Old World Map Jigsaw Puzzle is very high quality. 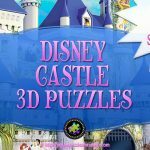 The finished puzzle is 48 inches by 32 inches and is made up of 3000 perfectly crafted jigsaw puzzle pieces that will allow for an exact fit. 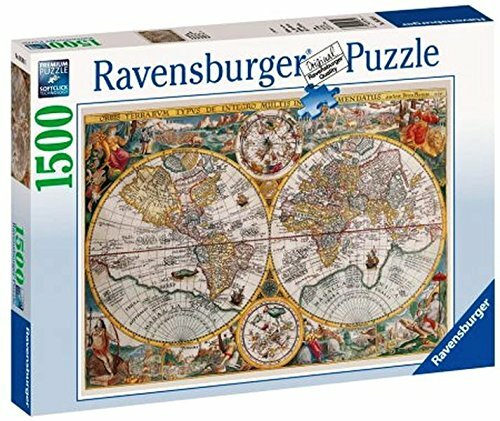 This Ravensburger World Map Puzzle is fantastic puzzle! 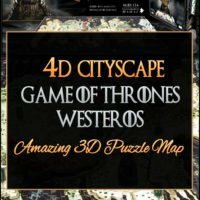 If you aren’t up to working on a large Old World Map Jigsaw Puzzle or maybe you just don’t have the space to acommodate such a large puzzle then you’ll enjoy the 1000 piece puzzles below. They still have the top notch quality you’d expect in a larger puzzle but take up way less space. 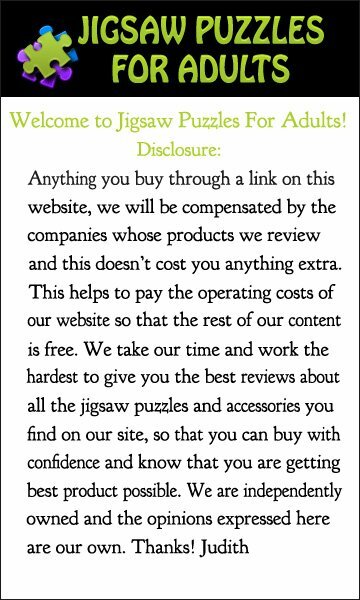 Actually you could use one of the many puzzle boards that are available here. 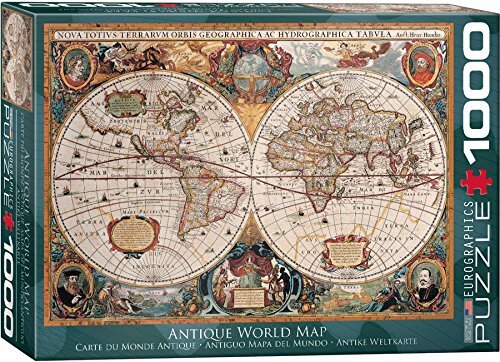 If you are looking for a challenging Old World Map Jigsaw Puzzle that is really beautiful when completed this 1000 piece Antique World Map by Educa might be just what you are after. 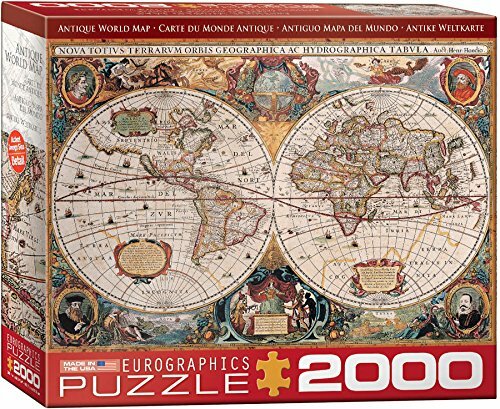 ThisOld World Antique jigsaw puzzle map by the European puzzle company Educa. The completed puzzle measures 26.75 inches by18.75 inches when complete. 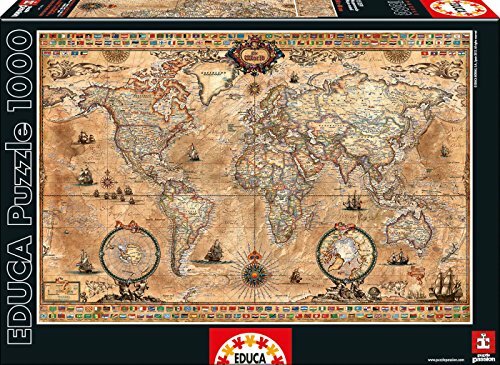 Educa puzzles are known worldwide as the being one of the top quality puzzles available and a leader in innovative graphics and puzzle art. 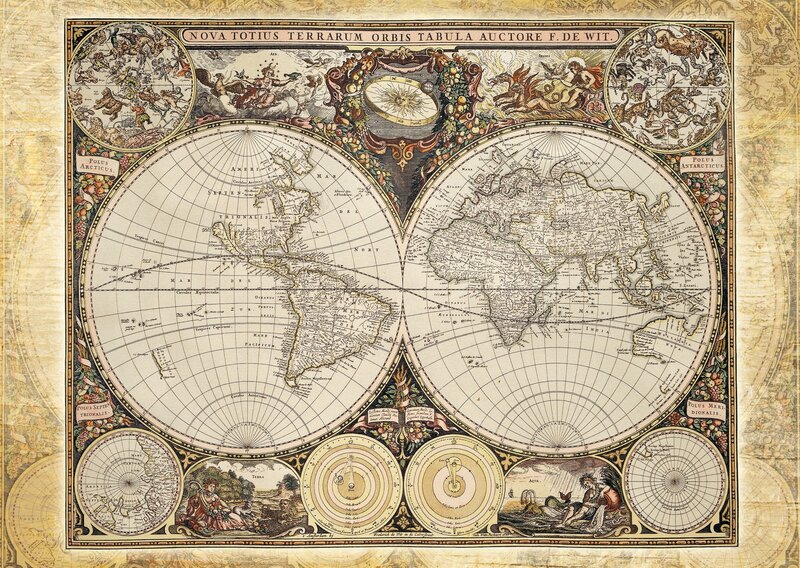 One thing to be note is that the Countries in the puzzle are based on our modern times however, the maps appearance is that of an eighteenth century sailor’s map. It is really a wonderful puzzle. 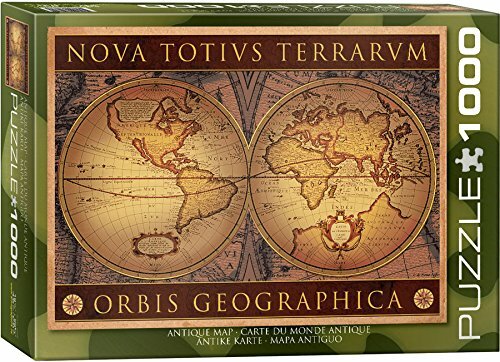 Wentworth Terrarum Orbis Old Map Wooden Jigsaw Puzzle is made up of 40 laser cut pieces and contains whimsies, pieces that reflect the theme of the puzzle. 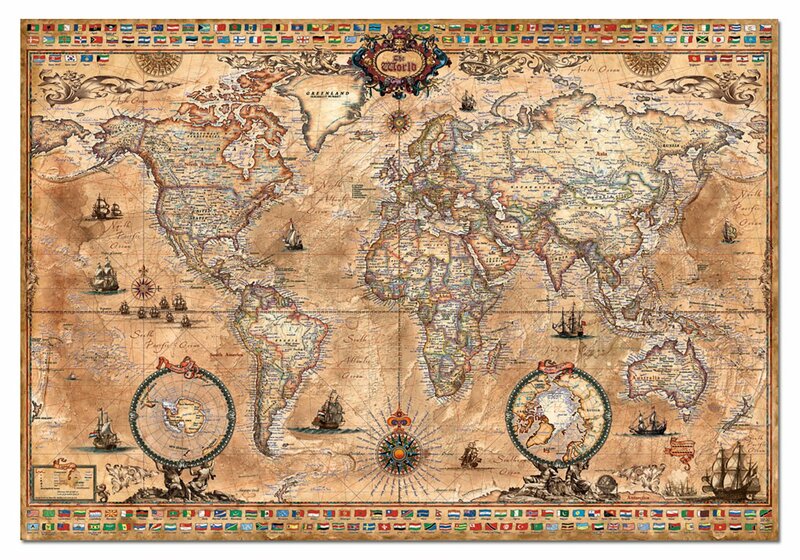 This old world map jigsaw puzzle is by the British Wentworth wooden puzzle manufacturer. This puzzle measures 4 ¾ inches by 3.23 inches (120 x 82 mm). 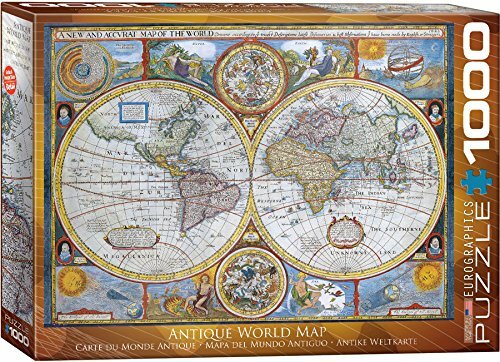 This Wentworth Old Map Jigsaw Puzzle wood make the perfect gift for anyone who is a fan of Old World Maps.